I am typically very skeptical when it comes to trying new hair products. I feel like all of them promise amazing results (complete with images of some model with Hollywood quality hair) and then the same thing happens: I buy it, I use it, and my hair looks like a limp, greasy mess. I was hoping my experience with Bosley Pro hair products would be different. Bosley is the maker of professional strength hair products designed to help people who have fine hair or who are experiencing thinning hair and hair loss. These salon quality products contain ingredients that are FDA approved and clinically proven to help people struggling with these types of hair problems. 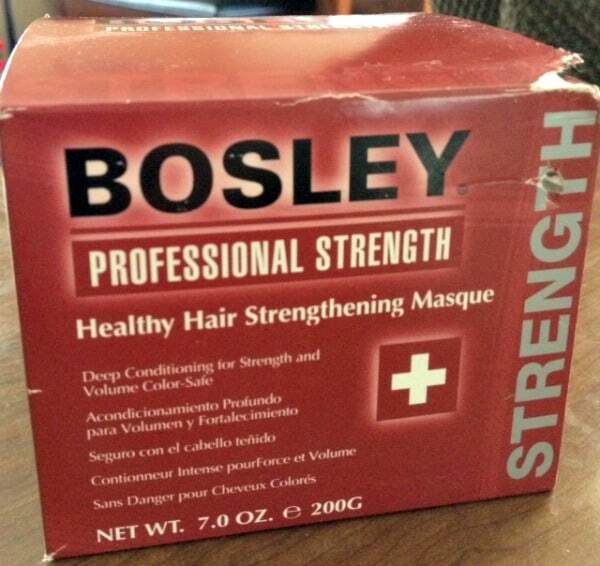 I received the Bosley Pro Healthy Hair Strengthening Masque ($38.95) for review. This is a deep conditioning masque designed to provide strength and volume to weak, damaged or limp hair. I had never really considered my hair thin because I have a large amount of it and it definitely gets an insane volume boost from humid weather. However, each of my individual strands is quite thin and many products designed to give more volume merely weighed my hair down even more. I knew right away that this masque was different just by scooping some out of the jar. The product feels light-weight to the touch and has a very fresh, almost plant-like scent. I appreciate that it isn’t overpowering because I don’t like when hair products have an aggressive odor and I think this scent makes it a more gender neutral product, which I appreciate. After leaving the masque on for about five minutes, it rinsed out very easily. I did not feel any heaviness or stickiness in my hair. I didn’t have to rinse multiple times just to feel like my hair was actually clean. I let my hair dry naturally as I always do (blow drying makes me frizzy) and then I seriously went on to have the best hair day I have had since the last time I visited a salon. The product is anti-aging and stimulates hair growth while providing shine and moisture. It is safe to use on color treated hair and helps to prolong and correct color. Plus my hair still felt amazing the next day when I often would start to experience build up from some of the heavier products I have tried. You can visit the Bosley Pro website for more information about this and the other products included in their line. They also provide a salon locator to help you find local salons that carry the Bosley product line. These products are also available at Ulta stores. You can connect with Bosley Pro on Facebook for more information. This sounds promising as I also have fine hair and have problems finding products that dont make me look like a walking crico can. Im going to give this a try and see how it works for me! Thanks for the review! I’ve been coloring my hair for so long now it’s definitely damaged. Would love to try this! I don’t like the greasy feeling of some hair products either so this looks like something I might like. I need something like this, as I have the same issues with my limp heavy hair. Thanks for the review I am definitely going to write this on my list of things to buy. Sounds like a product I’d like to try. My hair needs a pick me up. This product sounds exactly what I have been waiting for this past year! I have experienced hair loss due to medications, they also make my hair dry and brittle so alot of breakage is going on. I appreciate that you mentioned the scent and that it was gender neutral because thats a selling point for me. I hate smelling like products and feel those with scents are usually less natural. Thanks for the info and the link to Bosley. Another great review! 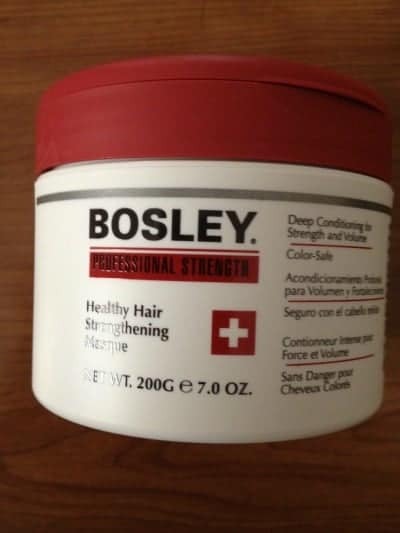 I haven’t found a hair strengthening formula that delivers, but Bosley Professional Strength sounds promising. Thanks for the review. Wow! I will have to share with my daughter. She has fine, thin hair and has tried numerous options and products. Right now, she is even taking vitamin pills to try to build it up – she was recently very sick and lost her nutrients. Like you, most products end up weighing her hair down but this sounds like it might work to pump up her volume, too.